I loved Daredevil during Bendis’ run on the title. I was sad to see him leave. I was worried if Daredevil would suffer from a dip in quality. Wow, was I ever wrong. Ed Brubaker has this title humming! As a matter of fact, I think Brubaker’s Daredevil is even more entertaining that Bendis’ Daredevil. It is Saturday morning, I have my Café Bustelo and I’m ready to review Daredevil #84. Synopsis: The issue starts with a new inmate being brought into Rykers’ Island: Bullseye. Daredevil continues his reign of terror in the prison. 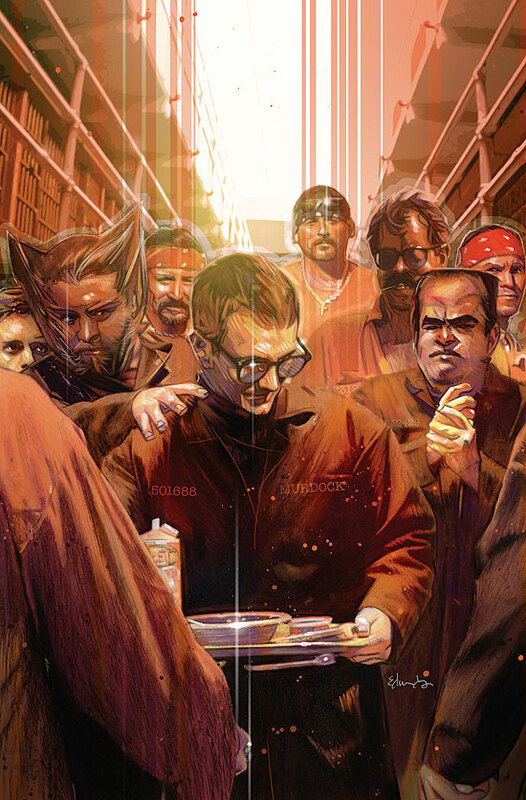 All the inmates and the guards are terrified of Matt Murdock. One of the guards tips Matt that the guard who had Foggy ambushed will be returning today. We then cut to J. Jonah Jameson running a front page article accusing Matt Murdock of being responsible for all the violence that is running wild at Rykers’ Island. Ben Urich is less than thrilled. Ben then gets a call from Dakota who says that she has some new pictures of the imposter Daredevil. We then cut to the officer McHenry walking alone. The lights get shattered. That leaves McHenry alone in the dark with Daredevil. Matt questions McHenry if he knew about the plan to kill Foggy. McHenry swears he did not and Matt knows he is telling the truth. McHenry tells Matt that it was Hammerhead who got him to do it. Later that night, Matt sneaks out of his cell and pays Hammerhead a visit. After taking out Hammerhead’s two guards, Matt enters Hammerhead’s cell. There Matt puts a savage beat down on Hammerhead. It is pretty vicious. Hammerhead said that it wasn’t one of his men who stabbed Foggy. And that he was just paid to attack Matt. Hammerhead said the person that paid him used to be a bagman. His name is Murphy. We then cut to Ben Urich and Dakota meeting with Ivan Murphy. Murphy tells them that he got the pictures of the fake Daredevil from a lawyer named Alton Lennox who claims to know Daredevil. Ivan leaves and Ben tells Dakota that Ivan Murphy used to work for the Kingpin and Ben thinks that he is setting them up. We then cut back to Rykers’ Island where the Warden is begging Matt to stop his reign of terror and violence. 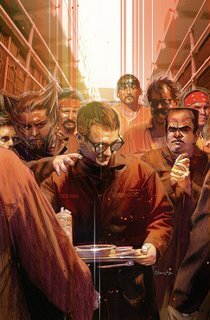 We then see a new inmate being brought back to general population at Rykers: Kingpin. (Oh, man. First Bullseye and now Kingpin!) Kingpin tells one of his flunkies to deliver a message to Matt Murdock. The Good: Damn! Daredevil #84 was an excellent issue! Daredevil just keeps getting better and better with each issue! First, the writing. Ed Brubaker is a total stud. He is quickly becoming my favorite writer. What he is doing on Daredevil is just incredible. Brubaker writes some great dialogue. Plus, he creates nice balance of action and dialogue heavy scenes. And I love how Brubaker is writing Matt Murdock. Brubaker has definitely given Matt a serious set of balls! Watching Matt basically take over Rykers’ Island is great. And I like how vicious Matt is now. Brubaker has stripped away all of Matt’s restraints and sensibilities. All we are left with is a man who is raw and exposed with nothing left to lose. That makes Matt more dangerous than he ever has been. The scene where he tortures Hammerhead to get his answers really highlights this change in character. It works and I like it. Brubaker is like a mad scientist with this Rykers’ Island storyline. First, he adds Daredevil with some low level criminals like the Owl and Hammerhead. Then at the beginning of the issue Brubaker sprinkles some Bullseye into his mix. Then he adds some Kingpin to his concoction. And then, for the final ingredient a pinch of the Punisher!! Can you imagine the fun Brubaker is going to have with a prison housing Daredevil, Bullseye, Kingpin and the Punisher! We are in for one wild and crazy ride. I cannot wait for the next issue. Of course, we still have the unsolved mystery of the fake Daredevil. I’m still curious to see where Brubaker goes with this storyline. Lark and Gaudiano’s artwork is perfect for this title. This isn’t normally my style of art. But, any artist can be good as long as you find him the right title. Daredevil is the right title for this artwork. If this was X-Men, Avengers, Iron Man, JLA, JSA, etc, then I would not be happy with the art. But, on Daredevil this art is absolutely perfect. I wouldn’t want any other art on this title. Lark and Gaudiano’s artwork captured Brubaker’s tone. This art adds to the darkness, chaos and insanity that is taking place in this title. This art definitely makes Daredevil a more powerful read. The Bad: Seriously, I have no complaints about Daredevil #84 at all. I don’t know how anyone could complain about this comic book. I cannot recommend Daredevil enough. Everyone should go to their comic book store and check out this title. You won’t be disappointed.